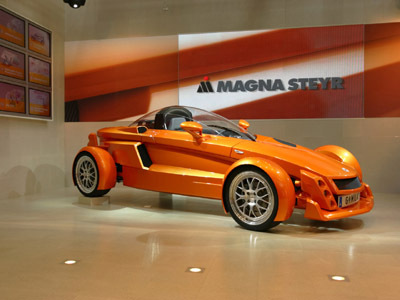 The Magna Steyr MILA Concept showcased at the 2005 Frankfurt International Auto Show was a single-seater sports car concept with a mid-engine, rear-wheel drive layout. 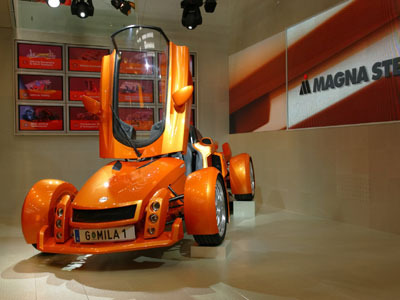 Austria based automotive engineering and manufacturing company Magna Steyr, used the MILA Concept to display their ability to make complete cars, as well as demonstrate their engineers' creativity and skill in creating innovative and technically advanced vehicles. The MILA's engineering highlights include an Eco-friendly, compressed natural gas fueled engine, which when combined with lightweight construction techniques (final weight is 850 kgs) allows for sporty performance. The MILA's modular design allows different versions of the concept, one or two seats etc, to be built with minimal difficulty. Magna Steyr are big believer's in the future of natural gas powered vehicles and the MILA Concept will focus more on the development of natural gas engines in the future. The mid-mounted engine used in the MILA Concept is a standard 1.6-litre four-cylinder model that was converted to run solely on natural gas. 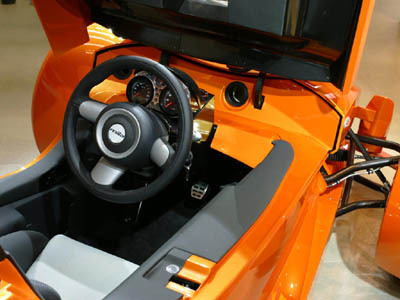 The only modifications necessary were the installation of natural gas fuel injection valves. Power figures are respectable, maximum power of 150 hp allows the MILA to achieve a top speed of 125 mph and acceleration from 0 to 62 mph takes just 6.9 seconds. Magna Steyr expect the target audience for the MILA Concept is diverse, and includes: "Individualists, techies and lifestylers with a penchant for innovative, original, pioneering vehicles Drivers who are looking for a vehicle using eco-friendly alternative fuels that they can drive in built-up areas, even when environmental regulations close city centres to private traffic (e.g. ban on driving because of particulate emissions, Fresh-air aficionados who don't really want to miss the feeling of riding a motorcycle, but still prefer to drive on four wheels (perhaps only because they don't have a motorcycle licence) with a roof over their heads if need be Potential buyers who already have one or two conventional vehicles in the family and are therefore interested in something "completely different" as a second or third car - a vehicle with a hint of Formula One fascination, a funky fun car with a sporty look, power and performance but at an affordable price". It's a nice thought.